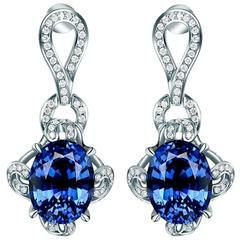 Material: 14k White Gold Stone Details: 2 Oval Sapphires at 1.80 Carats Total 72 Round White Diamonds at .72 Carats. Clarity: SI / Color: H-I Fine one-of-a kind craftsmanship meets incredible quality in this breathtaking piece of jewelry. All Alberto pieces are made in the U.S.A and come with a lifetime warranty!